Denver was originally the home of miners, smelters, and shipyard workers, but these industries eventually collapsed in 600 AS. With the declining long-term water situation in the California system, however, the wealthy elite of Los Angeles began to look elsewhere for a vacation spot and found Denver’s rough, beautiful vistas to be ideal. Emigration from Los Angeles and Manhattan injected new life into the Denver economy, reviving the planet even as the new upper-class assumed control of the local government. 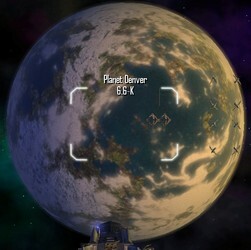 Today Cryer Pharmaceuticals maintains a major research lab on Denver, while Ageira Technologies has a planetside headquarters to oversee its interests in the system. Liberty Police, Inc. (LPI) is well paid by Colorado's new elite to handle security.